The soft volcanic tuff was perfect material for statue carving. Using harder volcanic rock implements they were able to first sketch out the Moai's outline in the rock wall and then systematically chip away at it until the Moai was held in place by a thin "keel". 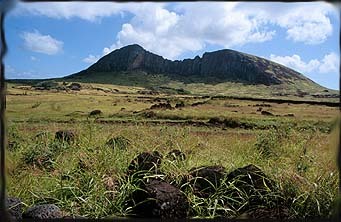 The moai carvers were master craftsmen that had rose through the ranks of a "carver's guild". The production of the statues was most likely through conscripted labour with many rituals and ceremonies performed throughout the process. The stone carvers were ingenious in making the most out of sections of rock. 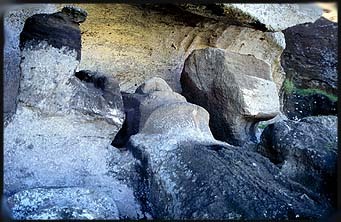 Moai can be seen carved in all directions in the cliff face. If a defect would appear in the rock the statue would be abandoned and they moved on to another area. They took advantage of fissures in the volcanic walls and also variations in colors. In short they were true artists. Finally when a statue was finished, it was broken off its keel and slid carefully down the slope using ropes tied to giant palm trunks which were sunk in specially prepared holes in rim of the crater. At the base of the crater they were raised up and final decorations were carved into its torso and back. Preparation was then made for transport across the island to various Ahu. It is believed that the statues were commissioned commemorative images of lineage heads. However, the moai are not portraits of specific individuals although some may have inscriptions or other markings that linked them with specific chiefs. 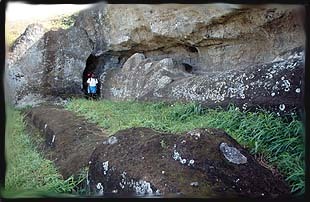 Why they chose the stylize design of the angular face and long phallus shaped bodies is unclear and is one of the greatest mysteries of the Rapa Nui. 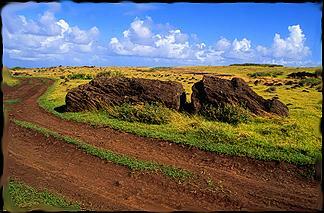 While there are some other stone sculptures made by Polynesians none is similar to the moai. In parts of South America some statues have been found that resemble the "kneeling" statue found on Rano Raraku (see Tour section) nothing, anywhere, resembles the standardized moai design that the Rapa Nui carved over a thousand times.